Where do the millions of computer monitors, cell phones and other electronic refuse our society generates end up? In places like Guiyu, China. There are similar places in other countries like India, and it’s unseen, underground, and highly toxic to the local residents. 60 Minute’s “The Electronic Wasteland” program (transcript: Following the Trail of Toxic Electronic Waste). 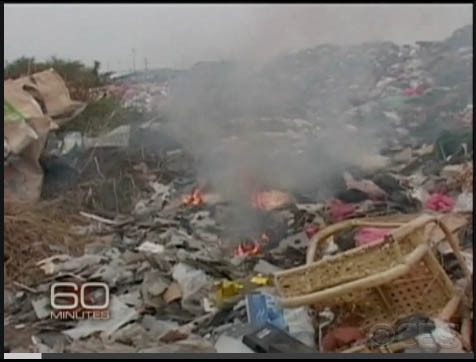 60 Minute’s “Following the Trail of Toxic E-Waste” program. 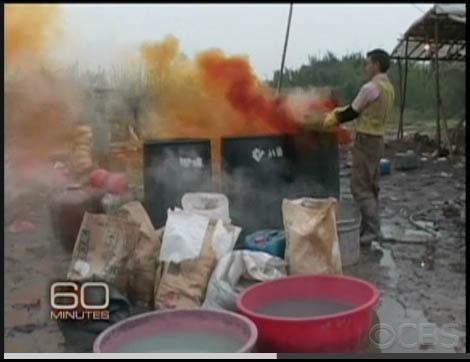 Time’s “China’s Electronic Waste Village” slide show. NYTimes.com’s “A Green Way to Dump Low-Tech Electronics” article. E-Stewards Initiatives by the Basel Action Network. San Francisco based Electronics TakeBack Coalition. VIA’s “Story of Stuff” blog post. The following photos are screen shots from the 60 minutes program. “…we throw out about 130,000 computers every day in the United States.” And…over 100 million cell phones are thrown out annually. Greenpeace has been filming around Guiyu and caught the recycling work. 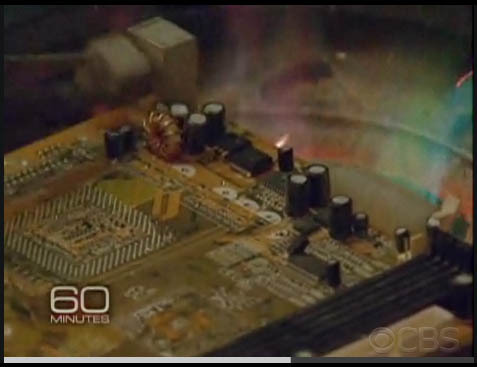 Women were heating circuit boards over a coal fire, pulling out chips and pouring off the lead solder. Men were using what is literally a medieval acid recipe to extract gold…We have a situation where we have 21st century toxins being managed in a 17th century environment. Pollution has ruined the town. Drinking water is trucked in. Scientists have studied the area and discovered that Guiyu has the highest levels of cancer-causing dioxins in the world. They found pregnancies are six times more likely to end in miscarriage, and that seven out of ten kids have too much lead in their blood. The recyclers are peasant farmers who couldn’t make a living on the land. Destitute, they’ve come by the thousands to get $8 a day. Greenpeace introduced us to some of them. They were afraid and didn’t want to be seen, but theirs are the hands that are breaking down America’s computers. The world is broken, and we are holding the hammer. I’m thankful for these reports, the investigations, and most of all for the efforts of those who are attempting to remedy the situation. I’m mostly concerned that the vast majority of us simply do not care. Kristof’s recent article, When Our Brains Short-Circuit may be a huge part of why, but I muse that we all may be suffering from a global and social sociopathy. Perhaps this is mere ignorance; that if we know better, we’ll do better. Maybe, but my cynical self can’t help but think that selfishness, greed, narcissism, and possibly prejudice, racism, ethnicism is also at work. And the solution is not found in changing big systems, but rather, the solution is making big changes in individuals. It is unfortunate that these other countries have to suffer due to our selfishness and greed. It is good to see that there are programs and companies out there that are trying to make a change and reduce the impact on the environment.